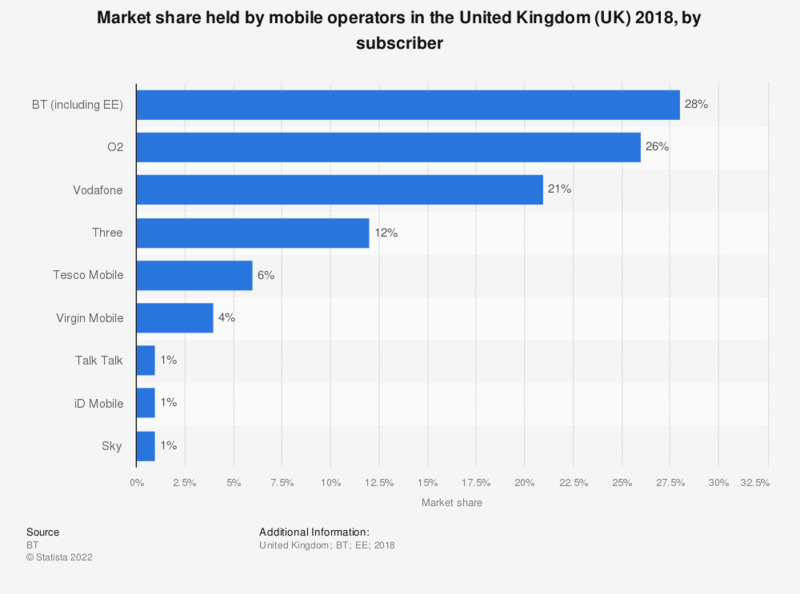 This statistic shows the market shares held by mobile operators in the United Kingdom (UK) as at 31 December 2017. BT, including Everything Everywhere (EE) held the greatest share of the market with 28 percent followed by O2 who held 26 percent. The four main mobile network operators (MNO) in the UK are Vodafone, Three (3), EE and O2. Most others are categorized as mobile virtual network operators (MVNO). These companies purchase the right from the MNO to use the wireless network infrastructure over which they provide their services to customers. EE was established by Deutsche Telekom and Orange S.A., but was later bought by the BT Group. There is a growing array of MVNOs under EE with it's number having reached approximately 4.2 million MVNOs in 2015. O2 (UK), formerly known as BT Cellnet, was also purchased by a larger company. In 2005, the Spanish company Telefónica purchased O2. Market share in this statistic is measured as a share of the total subscriber base. China: Which mobile operator/carrier do you use for business purposes?